This book is devoted to the investigation of a special topic in theoretical computer science - Parallel Computing and Programming as an abstract measure of the complexity of parallel computing problems. Its main aim is to show how the theoretical study of parallel computing complexity can be useful in the process of designing effective parallel algorithms. 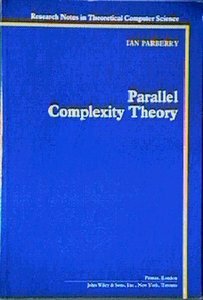 The author shows how to get important information about the parallel complexity (parallel time, the number of processors, the descriptional complexity of the topology of the parallel architecture) of specific computing problems from knowledge of their parallel computing complexity. The book is written as a textbook for undergraduate and graduate students and provides a careful explanation of the subject as well as motivation for further research.